“Ammolite” is the trade name referring to gems cut from fossilized ammonite, an extinct group of marine invertebrate, also collected as whole specimens. Korite International Ltd., which began as Korite Gems in 1977, is the primary company mining, fashioning, and marketing the world’s Ammolite. The company is located in Calgary, Canada, and mines for ammonite near Lethbridge, in the province of Alberta. 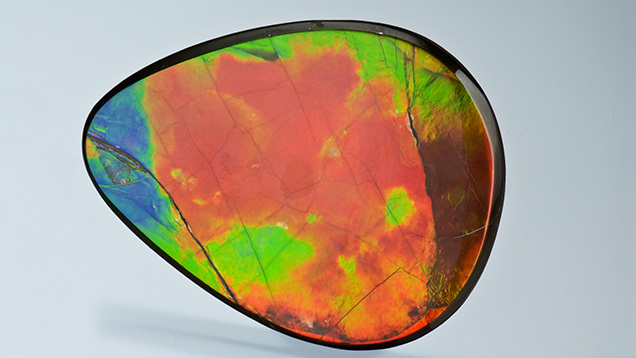 While the ammonite deposit was first recorded in 1908 by a National Geographic survey, local lapidaries of Calgary only started fashioning Ammolite in 1962—which is hard to believe since lapidaries are always looking for new and unique materials to cut. Author Stuart Wilson was recently given a tour of Korite International by company president Pierre Pare. 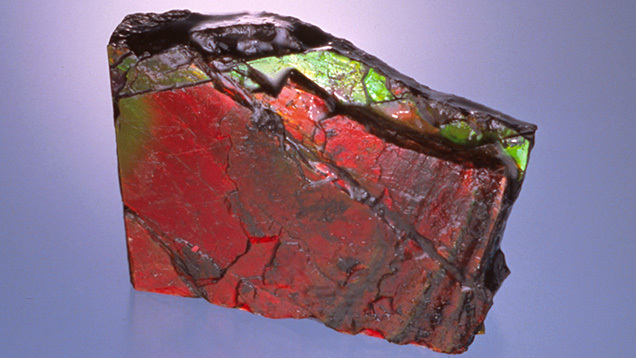 He documented the experience, which included a visit to the mine site, in his June 2013 Rock & Gem article, “Ammolite: An Organic Jewel.” The article offers a thorough overview of Korite’s operation and how these fragile shells are mined, an excavation process that often occurs at depths of 50 to 60 feet. Unlike the vast majority of ammonite deposits found around the world, the specimens found at Korite’s mine site have a fossilized outer shell that’s iridescent as a result of replacement by aragonite. 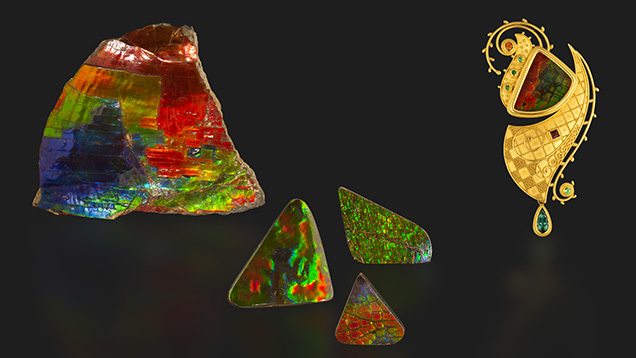 The iridescent phenomenon in Ammolite arises from the interference of light bouncing off stacked layers of thin microscopic platelets that make up the replaced aragonite in the ammonite shell. According to the article, the gem can be found along the east side of the Rocky Mountains, but this is the only economically productive area of gem-quality Ammolite in the world. Five 10-gallon buckets of ammonites are extracted weekly from the shale pit where they are found. Approximately five acres are mined annually, utilizing two excavator machines working in different areas, and a spotter who stands near each one, looking for any ammonite that becomes exposed. Ammonites may be found at any level, but the deeper the excavation, the more expensive the overall process. Because ammonite shells are fragile, the weight of thousands of feet of sediment cracked most of them during fossilization. Whole, unblemished specimens without fractures are found, however, and their rarity is reflected in their high price. Because of their fragility, Ammolites are most often fashioned into triplets consisting of an Ammolite layer with its original shale backing, and a synthetic spinel or quartz cap. Only about 100 solid Ammolite stones are cut annually. A large percentage shows a green-red color shift due to a more stable, thicker layer of aragonite. The blues and violets are rarer due to the fragility of the thinner layers necessary to produce these colors. Korite International has come up with a logical grading system that has been accepted by the international gem community. In stones that are “AA” or “exquisite,” the highest quality, three or more brilliant colors must be evident. Only 3−8% of Korite’s annual production meets this grade. “A+” or “extra fine” grades display three or more brilliant colors with less-brilliant areas. “A” or “fine” material has one or more colors, with either one that is brilliant or three that are less brilliant than those in the “A+” class. “A-” or “standard/good” comprises approximately 40% of Korite’s annual production and is characterized by Ammolite that shows mostly shades of green or red that are strong but less brilliant than the preceding grades. “B” or “fair” material displays one or two colors of fair brilliance. These stones are generally set in silver, as gold settings are reserved for the higher Ammolite grades. “C” or “commercial” quality material applies to only 5−10% of annual production and displays faint color patches or has unattractive fracture patterns. Production has been consistent, despite being hindered by permafrost in the winter. While the article doesn’t shed new light on Ammolite, it provides a good overview of the stone, which has seen an increase in sales. The Chinese market has been particularly significant to Korite’s success, according to the article, as Asian collectors tend to appreciate phenomenal stones. Jo Ellen Cole, a GIA Graduate Gemologist and Fellow of the Gemmological Association of Great Britain, has worked in the gem industry for more than three decades. Her career includes years in management at Guild Laboratories in Los Angeles, as well working at GIA, first as a research librarian and later as curator of the Institute’s Permanent Stone Collection. Since 2002, she has offered appraisals, identification, and museum display consultation under Cole Appraisal Services. 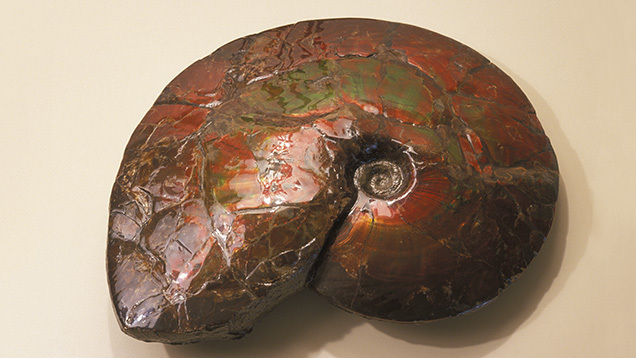 Explore the history, occurence, and properties of fossilized ammonite from Southern Alberta, Canada in this comprehensive report from the Spring 2001 issue of Gems & Gemology.